Will this be your first ALA Annual Conference? Or maybe you haven’t been in a while and aren’t sure where to start your planning? 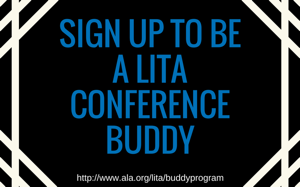 Get some help and learn more about LITA in the process by signing up for the LITA Conference Buddy program. It’s a great way to navigate the largest library conference, expand your network, and make new friends. The program is designed to make conference attendance more approachable, foster inclusion, and build connections by pairing you with someone who shares your professional interests and is familiar with Annual Conference. Or Be a Conference Buddy! Want to help someone new to Annual and show them how great LITA is? Sign up to be a conference buddy. Share your experience and network while learning new things and meeting new people. Application deadline to sign up for either role is June 7, 2019. If you have any questions about the program, please contact the Diversity & Inclusion Committee.